You’re at home, getting ready for work when the phone rings. Instead of wondering idly who could be calling at this hour, you tense up and break out in a sweat. You’re pretty sure you know who the caller is: a debt collector. It all started when you fell a few months behind on your car payment. Even though you called up the dealer and tried to work out a payment plan, you started getting calls from debt collectors. You feel completely helpless. You can’t afford to pay the debt in full, and these debt collectors are refusing to settle for anything less. It seems like there’s nothing you can do to get them off your back. But the truth is, you’re not helpless. There’s a federal law that protects you from being harassed by debt collectors – even if you can’t pay back the money. Here’s what you need to know about what debt collectors can do, what they can’t do, and how to protect your rights. If you’re late making payments on a debt, the lender doesn’t send it to a collector right away. There’s a simple reason for that: Hiring a debt collector costs a lot of money. Lenders would much rather deal with you directly if they can. First, they’ll start calling and writing you to remind you about the debt. If you can’t pay it all right away, they’ll try to set up a schedule for you to pay it back. Sometimes, they’ll even agree to forgive part of the debt if you pay back the rest right away. For them, giving up part of the money can be cheaper than calling in a debt collector. However, if you ignore the lender’s calls and letters – or if you set up a payment plan and then don’t make the payments – the lender will turn over the account to a debt collector. In most cases, this will happen when the bills have gone unpaid for three to six months. Internal Debt Collectors. These are people who work for the company that loaned you the money. Technically, they’re not “debt collectors” at all, because that term refers to people who collect debts for others. This means internal, or “first-party,” debt collectors don’t have to follow the same rules as other types of debt collectors about when they can contact you. However, this doesn’t mean that they’re more likely to be rude or aggressive with you. In fact, it’s in their interest to be polite, because they don’t want to make the company look bad. If you start getting calls about a debt that’s less than 90 days overdue, you’re most likely talking to a first-party debt collector. This is good news because it means your account isn’t officially in collections yet. If you can work out a plan with this person to settle your bill, you can prevent it from being reported to the credit bureaus and hurting your credit score. Collection Agencies. If a lender can’t work out a deal with you, it will turn your account over to a third-party collection agency. These companies charge lenders a fee to collect unpaid debts for them. Typically, this fee is somewhere between 25% and 60% of the money they collect. These companies will try as hard as they can to get the money out of you, because the more they collect, the more they get paid. This means they’re more likely to be pushy and rude. On the plus side, this kind of collector has more rules to follow about how it can deal with you. Debt Buyers. When a lender has tried and failed to collect on a debt, it often cuts its losses by selling off the debt to a debt buyer. These companies buy up bundles of old debts for pennies on the dollar. According to Investopedia, the average amount a debt buyer pays is $0.04 for every $1 worth of debt. They pay so little because they know they won’t be able to collect on most of the debts they buy. However, any money they do manage to collect is theirs to keep. One problem with debt buyers is that most of the debts they buy are quite old. Often, they don’t even know how old a particular debt is or where it came from. This means they sometimes end up pestering the wrong people over debts they don’t owe. The two types of debt most likely to be sent to collections are credit card debt and unpaid phone bills. Other common types include utility bills, car loans, and medical debt. The Fair Debt Collection Practices Act (FDCPA) sets rules for what debt collectors are and aren’t allowed to do. This law defines a “debt collector” as anyone who regularly collects debts on behalf of someone else. That means the law applies to collection agencies and debt buyers, but not internal debt collectors. Contact You at Home. Debt collectors are allowed to contact you by phone, letter, e-mail, or text message to try and collect on a debt. However, any message they send must clearly state that it comes from a debt collector. Charge Interest. Usually, when you borrow money, you agree to pay it back with interest. A debt collector is allowed to continue charging you that same amount of interest when they take over your debt. However, they can’t charge extra interest or fees that weren’t in your original contract. Also, most states put a cap on the total amount of interest and fees a debt collector can charge. Take You to Court. If you don’t pay back your debt, a debt collector can sue to collect the money you owe. You must show up in court to contest the suit. If you don’t, you lose your chance to fight the case. If it wins the case, the collector can get a garnishment order against you. This order directs your bank to turn over funds from your account to pay the debt. Garnish Your Wages. If you don’t have enough money in the bank, a debt collector can arrange to have your wages garnished. This means that your employer must take money out of your paycheck and turn it over to the debt collector. However, debt collectors can only do this after a successful lawsuit. They can’t simply seize your wages without a court order. Seek Payment for Old Debts. Every state has a statute of limitations on debt. Under this rule, once a debt reaches a certain age, the borrower is no longer legally required to pay it. This limit varies from state to state, but in most states, it’s between four and six years. Debts that have passed this limit are known as zombie debts. Debt collectors are allowed to contact you about zombie debts and seek payment for them. They can’t sue you to collect the money, but they can still put pressure on you. Keep You in the Dark. A debt collector must tell you, in writing, exactly how much you owe and to whom. This letter must be sent within five days after they first contact you. It must also explain what to do if you don’t think you owe this money. Contact You Anytime, Anywhere. Debt collectors are allowed to call you – but not at all hours. They can’t call you before 8am or after 9pm unless you specifically agree to it. They also can’t call you at work if you tell them, either orally or in writing, that you’re not allowed to receive calls there. Keep Contacting You if You Tell Them to Stop. If you don’t want a debt collector to contact you again, all you have to do is say so in writing. You can tell them to contact your attorney instead or to stop contacting you altogether. Send your letter by certified mail, with a return receipt, and keep a copy for yourself. Sending this letter doesn’t get rid of the debt, however. They can still sue you to collect if you don’t pay up. Pester Your Relatives. If you don’t pay what you owe, debt collectors can’t call up your family and friends and pressure them to pay it for you. They can only contact other people for one reason: to find out how to get in touch with you. And if they don’t find out what they want, they can’t contact the same person again. Pretend to Be Someone Else. When debt collectors call you up, they have to say who they are and why they’re calling. They can’t claim that they work for the police, the government, or a credit bureau. They also can’t claim to be lawyers unless they really are. Lie to You – or About You. Debt collectors are not allowed to lie to you in other ways either. They can’t lie to you about whether you owe a debt or how much you owe. They also can’t tell you that a paper they send you is a legal form if it isn’t, or vice versa. And they can’t ever tell you that you’ve broken the law if you haven’t. Debt collectors aren’t allowed to tell lies about you to other people either. They can’t give false information about your debts to the credit bureaus – or anyone else. Threaten You. Debt collectors aren’t allowed to threaten to throw you in jail if you don’t pay your debt. Owing money isn’t a crime, and you can’t be arrested for it. You can be sued, but debt collectors can’t threaten you with a lawsuit either, unless they plan to file one. They also can’t threaten to garnish your wages or seize your property unless they already have a court order that allows them to do it. And they’re never allowed to threaten you with physical harm. Harass You. Debt collectors aren’t allowed to harass you in other ways, either. They can’t use threatening or obscene language when dealing with you. They also can’t keep calling you repeatedly just to annoy you. Tell Others About Your Debt. Debt collectors can’t try to publicly shame you into paying your debts. For example, they can’t publish your name – or threaten to publish it – if you fail to pay your debt. They also aren’t allowed to contact you by postcard, which other people might see by accident. Under the law, they can’t talk about your debts to anyone but you, your spouse, or your lawyer. However, they are allowed to report your unpaid debt to the credit bureaus. Charge You for a Dead Person’s Debt. It isn’t possible to inherit debts from a person who has died. Any money that a person owes after death comes out of that person’s estate. If there isn’t enough money in the estate, the debt goes unpaid. Either way, relatives are not responsible for it. Apply Your Payment to the Wrong Debt. Sometimes, the same debt collector is trying to collect more than one debt from you. In this case, if you make a payment, you get to say which debt you’re paying. The debt collector is not allowed to put your payment toward a different debt. It also can’t apply the payment to a debt you don’t think you owe. Garnish Federal Payments. Debt collectors can garnish your wages to pay off a debt you can’t pay. However, in most cases, they aren’t allowed to garnish federal benefit payments. This includes Social Security, SSI, veteran’s benefits, disability benefits, and FEMA disaster assistance. Usually, when you get a call from a debt collector, it’s a legitimate business trying to collect on a real debt. In that case, you can rely on the FDCPA to protect you. If the debt collector doesn’t obey this law, you can sue. However, sometimes the people on the other end of the line are only pretending to be debt collectors. They’re really con artists trying to trick people into paying debts they don’t owe. Here’s how to spot these fake debt collectors, and how to handle them. They’re trying to collect on a debt you don’t recognize. They refuse to give their phone number or mailing address. They ask you for personal financial information, such as a credit card or Social Security Number. They use high-pressure tactics, such as threatening to have you thrown in jail. Ask for Contact Information. Get the caller’s name, company name, mailing address, and phone number. Any real debt collector is required by law to give you this information. If the person you’re talking to won’t give it – all of it – then it’s probably a scam. Get It in Writing. Ask the caller for a validation notice. This is a letter that outlines the amount you owe, the name of the lender, and your rights under the FDCPA. By law, any legitimate debt collector must provide this notice. Tell the caller you refuse to discuss the debt until you receive it. Break Off Contact. Once you get the caller’s mailing address, send a letter saying you don’t want them to contact you anymore. Any real debt collector must obey this request. If this one doesn’t, you know you’re dealing with a fake. Contact Your Creditor. Sometimes, the debt you get a call about is real – but the debt collector isn’t; it’s just a scammer trying to divert your debt payments away from the real lender. If you recognize the debt, but you’re not sure about the debt collector, get in touch with the original lender. Tell them about the calls and ask whether the debt collector you talked to is one that they’ve hired. Don’t Pay Up. If you’re not 100% sure the debt collector you’re dealing with is real, don’t make any payments. Even paying a fake debt in full isn’t always enough to make a scammer go away. Sometimes they make up another debt to try to get more money out of you. Don’t Give Out Personal Information. Even if you don’t pay the fake debt, there’s another way for fake debt collectors to make money off you. They can pump you for personal information – bank account numbers, credit card numbers, or your Social Security Number – and use it to steal your identity. For instance, they can charge stuff to your credit cards, write bogus checks, or take out new accounts in your name. To prevent identity theft, never give this kind of information to any debt collector – real or fake. Report the Call. If you get a call from a scammer, report it to the Federal Trade Commission (FTC) and your state Attorney General (AG). You can find your AG’s office through the National Association of Attorneys General. Even if the debt collector you’re dealing with is legitimate, that doesn’t necessarily mean they’re playing by the rules. You should still be careful in your dealings with them. Here are a few things you can do to protect yourself. Before you get into a discussion with the debt collector, ask for a validation letter. By law, the debt collector has to send you this, but they won’t always do it unless you remind them. Don’t agree to anything until you’ve seen this letter. After all, the information debt collectors have about your debts isn’t always correct. You don’t want to promise to pay a debt that might not even be yours. When you get the letter, check it to see what the debt is and whether you recognize it. Debts often get sold from one buyer to another, and mistakes can be made along the way. Debt collectors can end up trying to collect money that you’ve already paid back or never owed in the first place. For instance, they might come after you for a debt that belongs to someone else with a similar name. If a debt collector asks for money you don’t owe, you can dispute the debt. Send back a letter within 30 days stating that this debt isn’t yours. If you have any information to back up your claim, such as a canceled check that shows the debt was paid, enclose a copy. Send your letter by certified mail, and ask for a return receipt. That way, you can prove they got the letter if they deny receiving it. Keep a copy of it for your records too. Debt collectors can report outstanding accounts to the credit bureaus. That means if a debt collector makes a mistake, it can end up on your credit report as well. The problem can work in the other direction too. Sometimes, identity thieves take out a loan in your name and don’t pay it. When this happens, you’re the one who ends up getting the call from a debt collector. Either way, if a debt collector contacts you about a debt you don’t owe, check your credit report to see if the debt is listed there. If you find a mistake, contact the credit bureau to dispute it. If you tell a debt collector the debt isn’t yours, that’s not always the end of the story. They can write back with evidence that you do owe the debt, such as a copy of a bill in your name. Maybe you didn’t actually sign the bill – but it’s not always easy to prove it. If this happens, seek help from a lawyer. Lawyers who specialize in debt collection will usually let you consult with them for free. They may even agree to take your case for nothing if they think the debt collector has broken the law. If they win the case, they can collect the fee from the plaintiff. If you hire a lawyer, tell the debt collector you’ve done so. By law, from that point on, they must deal with your attorney, not with you. This saves you the hassle of dealing with calls and letters. Sometimes, you have no choice but to deal with a debt collector yourself. However, you don’t have to let them grill you at length. In a Bankrate article, consumer educator John Ulzheimer advises people to “say as little as possible” when dealing with debt collectors. They’ll try to pry details out of you about your ability to pay, but you don’t have to play along. Another expert, Geri Detweiler, says it’s also important to stay calm and focused. Debt collectors sometimes try to scare you into giving them what they want. Detweiler advises people dealing with debt collectors to “be a broken record.” Keep repeating the basic facts, and don’t give them anything else. It’s a good idea to keep written records of all your dealings with debt collectors. That way, if the debt collector breaks the law, you have your records as evidence. Keep all your records together in a single, labeled file. That way, you can find them if you need them. File all the letters the collector sends you, and copies of your responses. Also keep written notes of all your phone conversations. For each call, include the debt collector’s name, the amount they say you owe, the date and time, and a summary of the conversation. Also, save any voice mails they leave on your phone. When a debt collector first contacts you, they’ll probably try to get you to pay the debt in full, up front. However, if you can’t do that, they’re often willing to accept less. This is especially true for debt buyers, who bought your debt for pennies on the dollar. They don’t need to get back the whole amount to make a profit. However, even third-party collectors would often rather get part of the money right away than drag the case into court. In the Bankrate article, Ulzheimer suggests leading with a lowball offer. Tell the debt collector you’re willing to pay 10% to 15% of what you owe. They probably won’t accept that offer, but they’ll usually settle for 30% to 50% of the full debt. Alternatively, you can offer a “payment-for-deletion” deal. You agree to pay the debt in full, and the debt collector agrees to strike the collection account from your credit report. The debt collector will contact the credit bureaus directly to have the account removed. This can be a good way to deal with a bill that’s accurate, but got lost or overlooked. Credit bureaus frown on this practice, and not all debt collectors are willing to do it. However, there’s no law against it. If you can afford to pay off the full debt, this kind of agreement can give a big boost to your credit rating. If you work out a deal with a creditor, make sure you get all the details in writing. Don’t send any payments until you have this written agreement. This is especially important with a payment-for-deletion deal. It’s also important if the creditor is promising to take no further actions against you once the debt is paid. Once you have an agreement in writing, send your payment. It’s best to use a cashier’s check, rather than a personal check. That way, you’re not giving the debt collector access to your bank account information. You can also use your bank’s online bill payment service, if it has one. If you’ve agreed to pay back the debt in installments, the debt collector is likely to suggest that you let them withdraw the money directly from your bank account. This sounds convenient because they can collect each payment as it comes due, with no effort from you. However, experts say it’s a bad idea. Once a debt collector has access to your account, there’s nothing stopping them from diving in and taking the full amount you owe. Another trick debt collectors use is to suggest that you send them a series of postdated checks. That way, they can deposit each one on the appropriate date. By law, a debt collector isn’t allowed to deposit a postdated check before the date on the check. But debt collectors don’t always play by the rules, so experts say you shouldn’t agree to this deal either. As you pay back the debt, keep records of your payments. When you make the last one, get a receipt saying that the debt is paid in full. That way, the collector can’t come back a few months later and claim that you owe more money for interest or late fees. 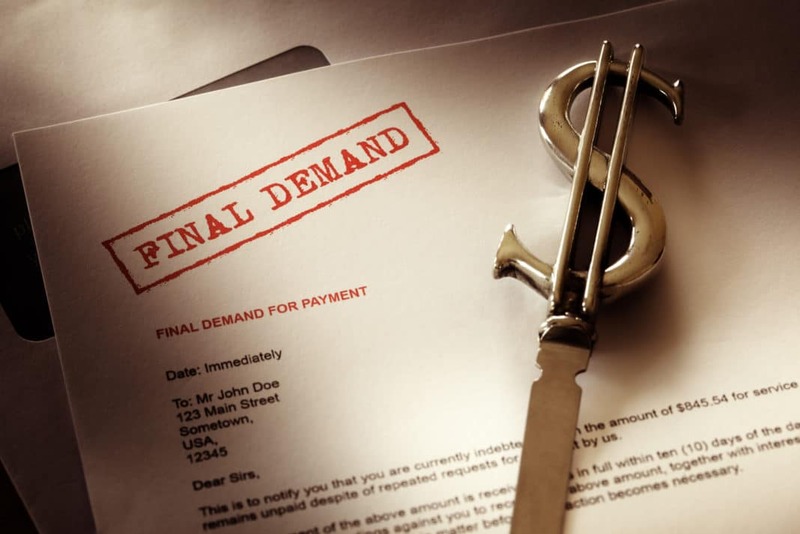 If you can’t work out a deal with a debt collector, the next letter you receive from them could be a court summons. Whatever you do, don’t toss it in the bin – even if you think you’ve made it clear you don’t owe the money. It’s true, there are some unscrupulous debt collectors out there who will send a fake court summons to try to scare you. But if it’s the real deal and you ignore it, you give up your chance to fight a wage garnishment. However, that doesn’t mean you should take a suspicious-looking summons at face value. Instead, check the summons out to make sure it’s genuine. Don’t just call the address or phone number given for the court on the summons itself. If the summons is a forgery, that information is probably fake. Instead, look up the court’s contact information yourself. Then call or write directly and ask if the notice is accurate. If it’s real, get in touch with a lawyer. Anytime you run into problems with a debt collector, you can report them to the FTC and your state AG. Many states have their own laws about debt collection that are different from the FDCPA. Your AG’s office can let you know what your rights are under state law. If it turns out the debt collector has broken the law, you can sue them in either state or federal court. You have up to one year from the time of the violation to bring your lawsuit. If you win, the judge can order the collector to pay you back for any damages you suffered, such as lost wages or medical bills. You can also be reimbursed for your lawyer’s fees and court costs. On top of that, the collector may have to pay you up to $1,000, even if you didn’t suffer any damages. If it turns out that many people were victims of the same debt collector, you can band together to bring a class-action suit. The debt collector can be forced to pay up to $500,000, or 1% of their net worth, whichever is lower. However, suing a debt collector doesn’t make your debt go away. So long as you owe the money, you still have to pay it – even if the debt collector broke the law while trying to collect it. As you can see, dealing with debt collectors can be a major hassle. Naturally, it’s worse if they use shady tactics. But even when they play by the rules, having a debt in collections is stressful. It also does a lot of damage to your credit rating. It’s much better to stop a debt from going to collections in the first place. If you ever find you’re falling behind on payments, don’t just cross your fingers and hope the lender lets it slide. Instead, contact the creditor yourself. Ask if you can refinance the debt or, failing that, work out a plan to pay it off. Bills can also end up in collections because you don’t know you have them. This can often happen with medical bills. The best way to prevent this problem is to keep a close eye on your mail. Open all bills right away, and if they don’t look right, call the creditor for an explanation. Have you ever dealt with a debt collector? What advice would you offer others about it?